An ideal resting place where offers you the finest touch of tradition, hospitality, and elegance. 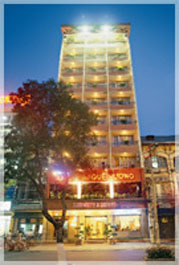 Located in the heart of Ho Chi Minh City within a 5-minute walk to Ben Thanh market and a 10-minute walk to Saigon River, major business centers, airline offices, and banks, Liberty 2 Hotel is a convenient place for travelers who come to HCM City for business or pleasure. With 31 air-conditioned & carpeted rooms – including 6 Executive Deluxe, 12 Deluxe & 13 Superior rooms – Liberty 2 Hotel will always be the ideal address for your next business or leisure trips. Champagne Restaurant is an ideal place for guests who enjoy European, Asian & Vietnamese exotic dishes, particularly seafood. On the 10th floor of Liberty 2 Hotel, this 150-seat restaurant is harmoniously decorated to create a cosy and friendly atmosphere where guests can enjoy wonderful food and view the skylines of the city.Private dining rooms, equipped with modern karaoke system, are suitable for birthday party, celebration and class party. Opening time : 8:00 am till late.